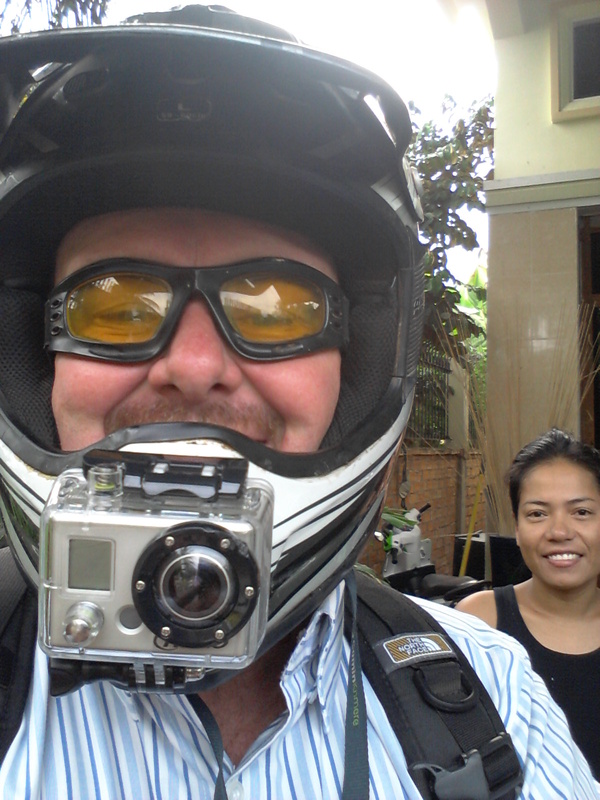 After much huffing and puffing and visits to 500 hardware shops to find the right bits and bobs I finally got my GoPro camera ( a much loved gift from Sarah and Shane back in Australia – thanks guys ! ) mounted to the chin of my helmet. After a quick trial around the hood yesterday I took the first video of my daily commute on the new bike this morning. It is no wonder the dude that brought these cameras to market has become a bazillionaire. They are just brilliant. One thing you notice as the person taking the video is that everything seems a lot closer than it really is so when you watch this video you’ll probably be winking at your seat but it isn’t that bad. Watch closely and you will see some great examples of “what traffic rules ??”. particularly at 13.41 and then 15.37. Extremely interesting , look forward to some pieces from said equipment . FYI you overtook 813 bikes/ vehicles on that trip. I was given the original one. They absolutely rock. Not sure how long they can record for. I’ll let you know after my day out biking with the boys on Sunday.. Cool video. I got a little seasick though. Well, I am sure that all of those sensible, law abiding Khmers will get used to you eventually! And why else would they put servos on corners if not to facilitate red light running? ?